I first laid my eyes on Ariel back in 2008. It was at a very rough shelter out in the very rough area of Mondragone, in Southern Italy north of Naples. It was actually one of the worst shelters I have ever seen, even until today. This was the first rescue mission AWL did, (Keegan, Dennis, Rosa, Bruce, Kathryn, Ylva, David, Todd, Andreas, and others) this is how six dogs came completely into my life. And actually, it is the genesis of why I started to dream about opening a hospice. The Italian Justice system convicted the woman who ran this shelter for neglecting the dogs there; she had 40 dogs locked in outdoor cages. AWL jumped in to try to find a better solution for the dogs there, rather than going to government shelters. The volunteers and I were shocked by the smell and sight of every cage. The dogs were standing in their own pee and poo, drinking their own pee, food every six days. It was a nightmare. We brought a veterinarian with us, who made vaccinations and examinations on all the dogs. We worked very hard for two days. I stopped outside one cage and that is when I saw Ariel together with several other dogs. I saw how crooked her right front leg was. She was probably eight years old and had been in four different shelters during her lifetime. Her leg had been broken in four different places and had to heal by itself on a cold concrete floor. She painfully moved around her pen only when she had to. Still, Ariel did everything so I wouldn’t miss seeing her. She danced happily and howled. I fell immediately in love with that strong loving lady’s face. Despite everything there was so much love and affection inside her heart. What amazed me the most was her longing for life, even after everything life had thrown at her. It took me one month to get her out from the shelter together with the other five dogs. The law had to give me permission to adopt them and that didn’t happen overnight. I found her best friend isolated in another cage, that friend’s name was Nebbia. I asked why Nebbia was isolated? They told me she was aggressive. Nebbia and I touched noses and she told me it was a misunderstanding. I took Nebbia and Ariel out, and that was one of the happiest moments in my life to feel the emotions inside my heart and my stomach. All that love that flew between us. 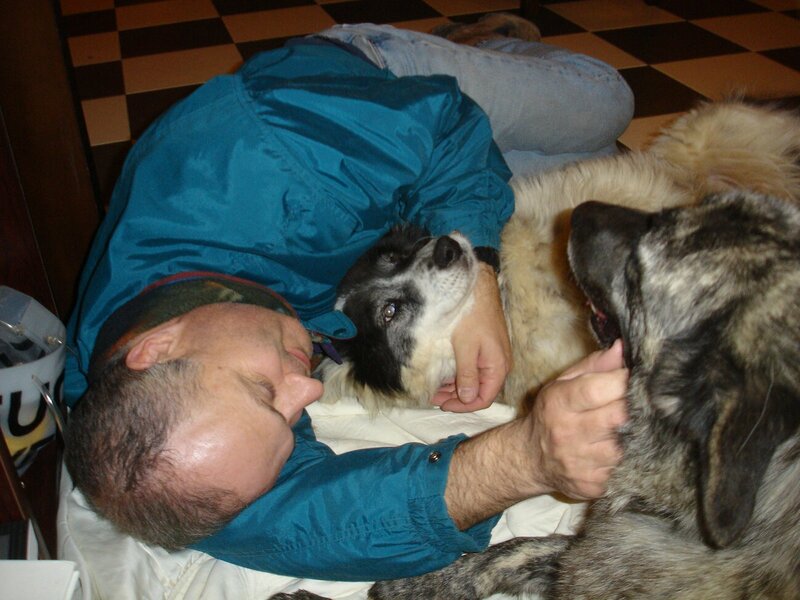 During my 20 years in the rescue world I kept telling people that to rescue a life is one of the most amazing things. I don’t ever see that thankfulness and cheerfulness in a human. We always have to go for therapy for years and in many ways we are very bitter towards life. 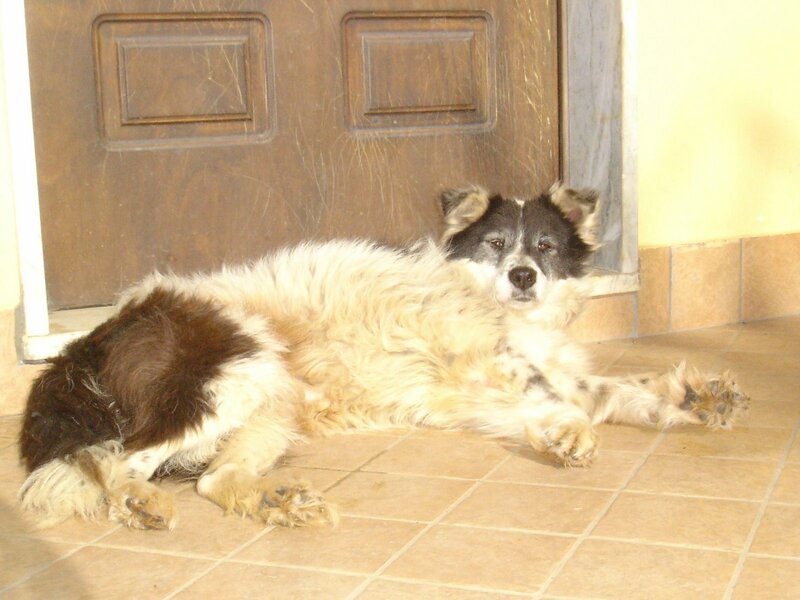 Ariel and Nebbia stayed in my home in Italy. They had the beautiful dining room- Salon for themselves, on their soft beds. Even today, Nebbia has not shown any aggressions, her label was a misunderstanding that made her sit for two years in a small cage by herself. When we moved from Italy up to Germany, the transition was long, it took time to find a house that would fit all my 15 dogs. Ariel and the other dogs had to stay at a dog hotel for a little while. 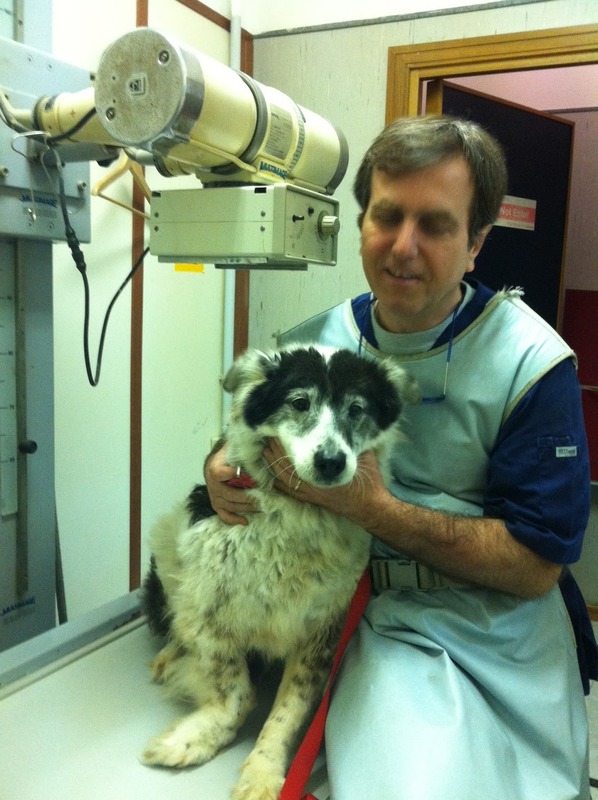 But Ariel didn’t’ do so very well there and she was moved to our hospice. And I can assure you; she was so loved by all the volunteers. When they opened the door into her room her tail went thump-thump-thump and she rolled on her back wanting everyone to scratch her belly. She was groomed, and looked like a young puppy girl. There were more than a few that, when seeing her for the first time, got very tear eyed. They looked at her crooked leg, but at the same time from her, they felt enormous love, not pity. She opened many human hearts. Last year we had her back x-rayed since her way of walking put a lot of weight on her lower back. We could see that her back would not hold very long. Ariel moved up to Germany and Nebbia was so pleased to see her again. Ariel took the position as the Queen among my pack. She loved food and she was the one who always told me at 15.00 to hurry up, it was food time. She kept the pack stable, and had her bed that no one else would touch. 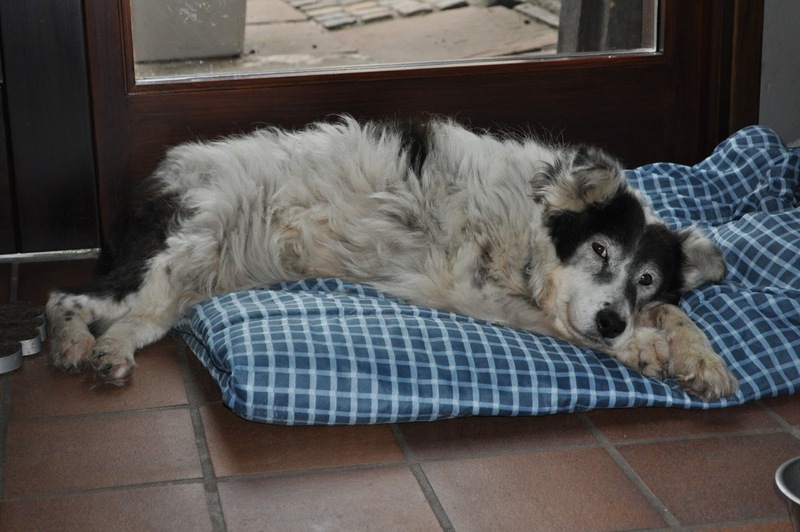 Ariel loved our floor heating, and her tail was always going “thump-thump!” She was always smiling, yes she could smile and it never failed to put a big smile on my own lips. For a couple of weeks now, I have felt her energy changing drastically. I cannot describe what I saw or felt, but something was not as it used to be. That very same day, I had two other dogs that were not doing well either, but the interesting thing was, when it was Ariel’s turn to be seen by our wonderful veterinarian Dr. Martina, I cried. I told our vet that I felt her internal organs were shutting down, and her lower back was in pain. Ultra sound, blood tests were taken, and her kidneys were shutting down. Ariel stopped eating, drank little water, and her tail was making weaker “thump-thumps.” I knew that her biggest freedom was calling her to come home. Even if I know her years together with us was amazing, a lot of love, friends, compassionate AWL volunteers that did everything for her, my heart didn’t want to let her go. At the same time to have done everything and know we could help her in a “non-suffering” way over to the bridge was a true gift, but still I didn’t want to. My friend came over to me and said she understood my feelings. I looked at her with a question marked written all over my face. How could she understand my pain, she didn’t even like dogs. Her smile was compassionate when she explained that she understood the feelings. Her mother had had Alzheimers and the pain to see someone you love slip away is painful. One part wanted to let her mother go peacefully over to the other side and the other side of her wanted to keep her mother in her life. We took Ariel’s bed and put it in our living room were it was quieter but at the same time she could be with us all. She could lay and look outside the big glass window. I informed the children what was happening, and we talked about it. The children changed their behavior around Ariel, calmer and plenty of compassion. 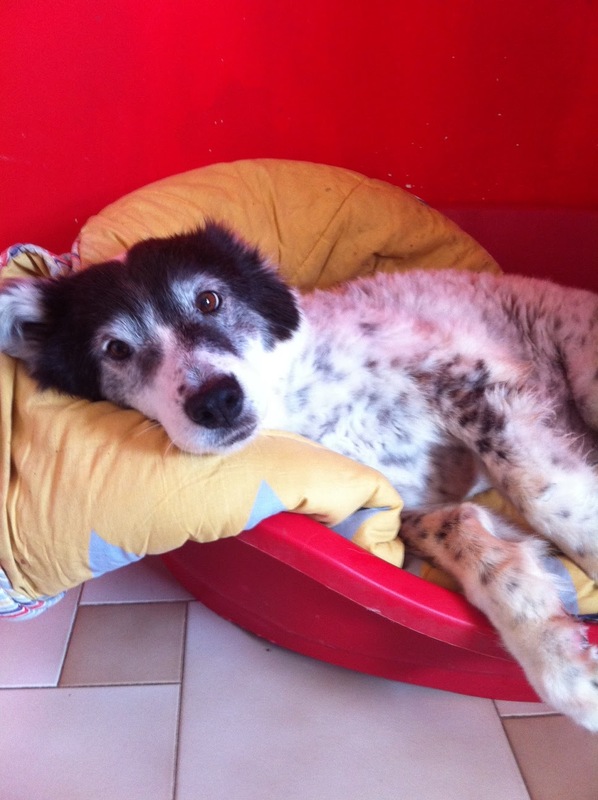 The pack of twelve dogs changed the first day I noticed the difference in Ariel’s energies. The pack slowly walked up to her and smelled her, and then backed away, it was their way of saying goodbye. I watched them and once again I tried to be as brave as they, not to be afraid, to accept that this is a huge part of life. Not to be afraid, to dare to love completely and live life to the fullest, and when its time to go….go with the heart filled and content. What a lovely tribute. God bless her. Beautiful touching story! I know what it's like to loose a beloved dog. RIP, Ariel.